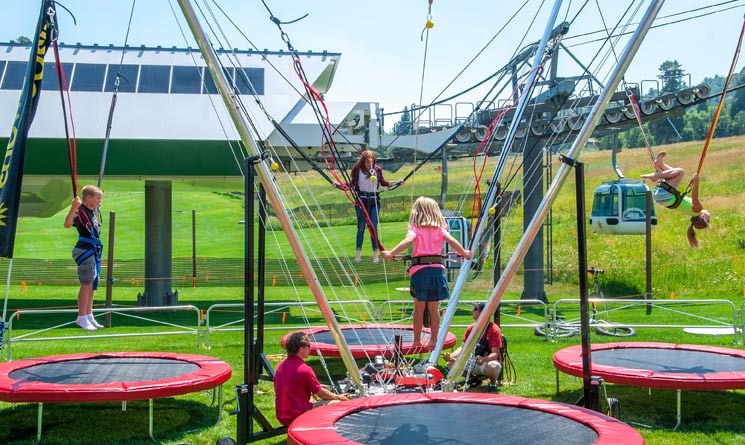 Snowbasin, UT – May 27, 2015 - Snowbasin Resort is now open for summer operations with exciting new family oriented additions to their already popular summer activities. Snowbasin Resort will be open for Saturdays and Sundays 10:00am – 6:00pm from June 13th- October 4th. Enjoy scenic Gondola Rides to Needles Lodge, mountain bike and hike on 26 miles of trails, play some disc golf on the 9-hole course, take the kids to the playground, enjoy brunch at the top of the gondola, explore your cravings at a themed mountain top dinner, or come to a free outdoor concert in the beautiful high alpine environment. In addition to the playground and spider jump that were added last year, the kid friendly activities continue to expand this season with a new climbing wall and obstacle course. The addition of two types of guided tours will add more family fun. Every Saturday, a guided tour will explore a different topic, including mountain biking, ski patrol and snow science, geocaching, wildflowers, snowmaking, tour of the cirques, how a ski lift works, and hiking with poles. These family oriented tours are every Saturday June 20 – September 26 at 10:30am. They are $15 per person and include a snack. A lift ticket can be added to the tour for just $5. Saturday tours are geared towards families, children 12 and under must be accompanied by an adult. Every Sunday, Kid’s Adventure Tours from 2:30 – 5:30pm are exclusively for kids age 7 – 12. The adventures vary each week, allowing your children to have some fun and learn new skills including how to identify animal signs, geology on the mountain, crafts made from plants, finding your way in the wild using navigation skills, and mountain recreation safety and etiquette. These adventures are a great way to let your kids have some fun while you enjoy Blues, Brews & BBQ! The Sunday kid adventure tours are $25 and include the tour, lift and a snack. Dining Discovery is back this summer with nine Culinary Expedition dinners. The Dining Discovery: Culinary Expedition events will be a themed adventure, centered on different cuisines including Regions of Spain, Cajun Shrimp Boil, Farm to Table, and Thai Fusion. These top of the gondola dinners will be an exciting and unique experience. Other Dining Discovery events will include a Wine Maker’s Dinner with Ste. Michelle Wine Estates, a Blue Moon viewing event, and a very special John Paul Campout event, the first summer event to be held at John Paul Lodge, and our first ever overnight event. The summer will be full of unique and one of a kind experiences at Snowbasin Resort. Come take a culinary adventure, try something new or indulge in your favorite cuisine, either way, these Dining Discovery events are not to be missed! Snowbasin Resort’s popular free concert series, Blues, Brews & BBQ will be back again this summer every Sunday with 3 bands each week including nationally touring artists, regionally touring acts and local talent. Enjoy your favorite BBQ items and local Utah craft beers along with snow cones and soft serve ice cream. With the new children’s oriented additions, the little ones will be occupied for hours while mom and dad enjoy the music and the fresh air. Bring your blankets, chairs and sunglasses to enjoy the afternoon of good food, fun, and music for the whole family! For more information please visit http://www.snowbasin.com or call (801) 620-1000. Snowbasin Resort, Top rated by Ski Magazine in the categories of Service, On-Mountain Food, Lifts and Grooming, is located less than 35 miles North of Salt Lake City. It has one of the easiest drives from Salt Lake International Airport as well as quick access to the Park City Area and Downtown Ogden. With 3,000 skiable acres and 3,000 vertical feet, Snowbasin Resort is best known for wide-open bowls, gladed runs, manicured groomers, powder stashes days after a storm, seven terrain parks, and excellent service. Snowbasin Resort has world-class snowmaking and one of the most advanced lift systems in the West. Enjoy award-winning cuisine including mountaintop dining with spectacular views and magnificent day lodges. Discover why Snowbasin Resort is consistently recognized as one of the best family resorts in North America!